It's official; I've done something to upset Cinabar! I must have as I don't even like Brussels Sprouts. I have them once a year, as some people seem to think they go well with Turkey, of which I also don't like that much either. These new Brussels Sprout crisps have recently been brought out by Walkers to punish me for some indiscretion or other. Brussels Sprouts also give me terrible wind, but most people who know me would probably say "what food doesn't?" 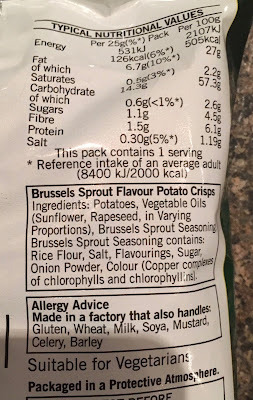 On opening the packet the greenish crisps (yes, they have a greenish tint a little bit like someone put a Gremlin in a blender nearby), smell like Brussels Sprouts and I guess look a little like Brussels Sprouts from really (really…) far away. I decided to use Cinabar's Mom as a Guinea Pig. She really didn't like the smell of them, even though she likes Brussels Sprouts and equally likes to torture me with them on Christmas Day. 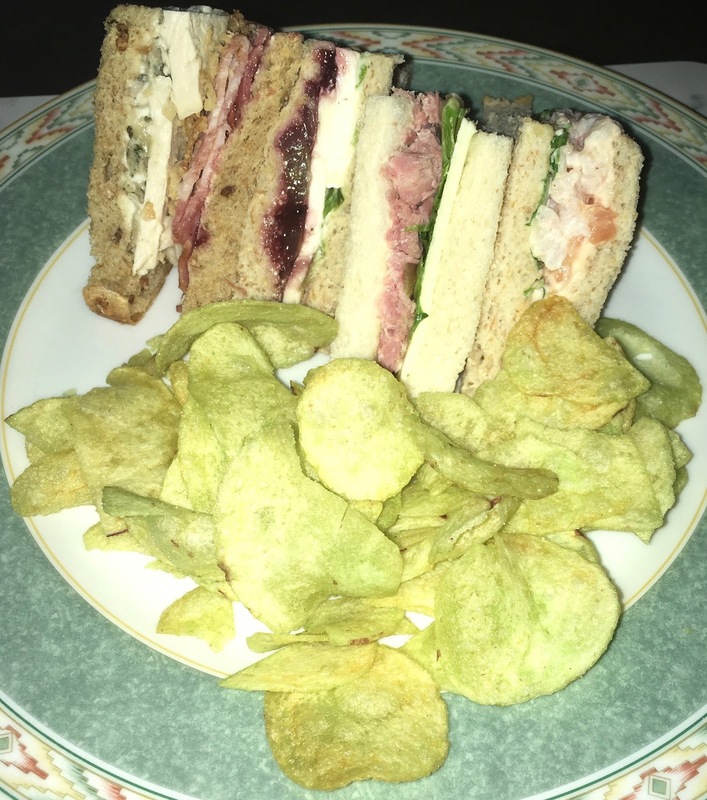 Cinabar was next to try them and said they were okay, saying that she liked their savoury nature, but she is way (way…) looking forward to Christmas too much. I'm a bit more of a Scrooge personally. I had to starve myself for much of the day and be really (really…) hungry to try them. 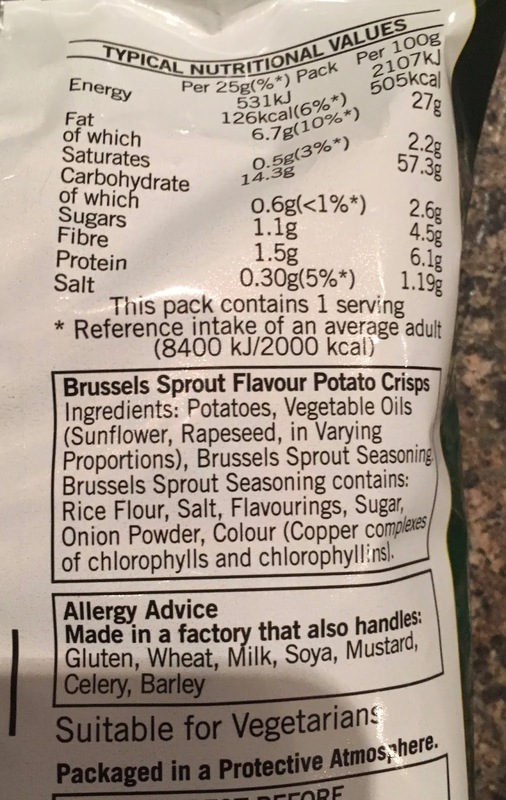 On taste the overpowering smell of Brussels Sprouts really does make these crisps taste like Brussels Sprouts. There's no getting away from the flavour, so I'd recommend you know you like Brussels Sprouts before you buy these crisps. If they're the last crisps in your house I'd recommend I spicy salsa dip to try to mask the flavour. 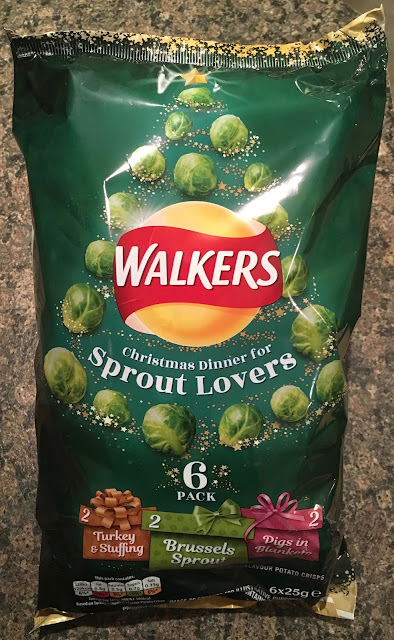 They don't taste all that bad, but they do taste of Brussels Sprouts. It does say it on the packet! 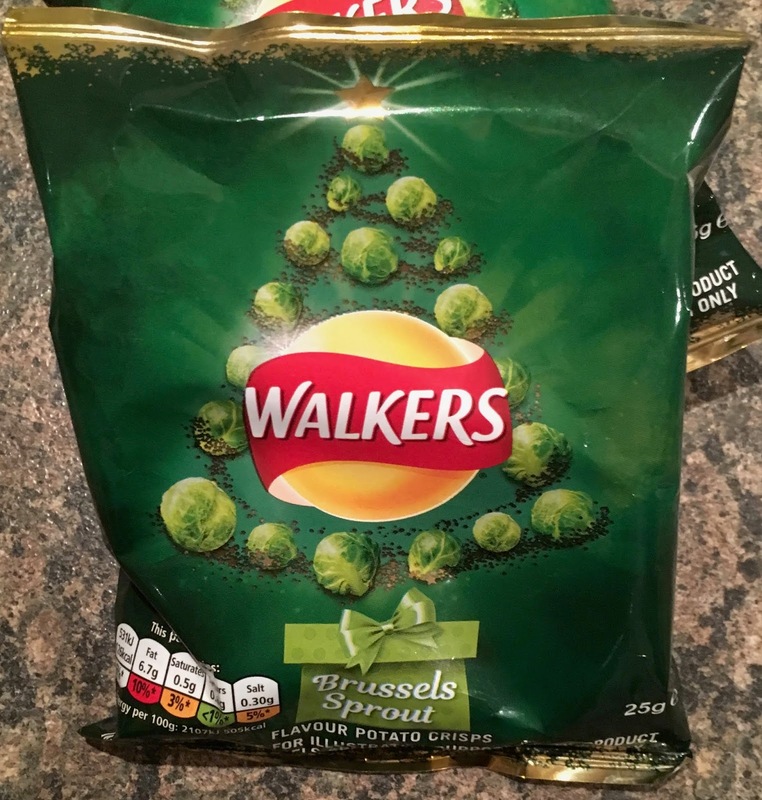 As well as these Brussels Sprout Crisps there are five limited edition Christmas crisps flavours to choose from; Turkey & Stuffing, Pigs in Blankets (the one I'm looking forward to trying most, as they are my favourite things on the Christmas meal), Cheese & Cranberry, and also Glazed Ham (and this is my favourite thing on Boxing Day!). The 25g bag has 126 calories, with 6.7g of fat, 0.6g of sugar and 0.3g of salt. Please see photograph for ingredients.